Sure, the wedding is usually all about the bride, but when you take tradition and throw it out the window for something that really interests the groom, it says “love.” Letting his boutonnieres speak for him is a perfect way for him to make a statement that will be subtle, but upfront for all to see. So, if your groom is a fan boy of comics, fantasy or sci-fi, using his favorite characters in his boutonnieres is an idea inspired ‘in a galaxy far, far away’. And he and his groomsmen will love it. The hero assigned as sidekick to each of your groomsmen look powerful and make a statement when they are worn alone on a lapel, unadorned and unencumbered. You will need to attach a pin finding on the upper back of each action figure to keep it from drooping forward. It is better to place the pin horizontally to keep it from moving from side to side, especially on a larger super hero. If you prefer a softer feel, or want to tie them into your floral design – no problem. Rest your action figure on a small amount of coordinating greenery, berries or flowers, and tie it up with a matching bow. Be careful not to overwhelm your figure by using too many flowers: you don’t want this creative and meaningful idea to get lost. Just a small amount of matching florals will tie the guys in. What a simple and perfect idea! 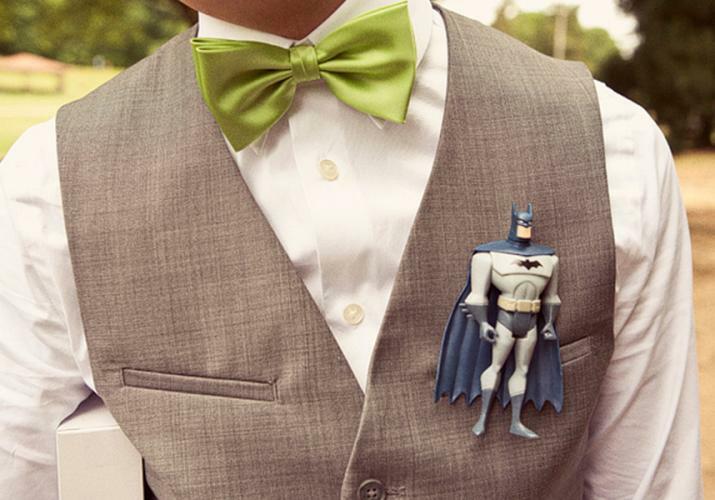 Simply tucking your action figures inside the groomsmen’s lapel pocket, with arms over the outside of the pocket, is super easy and cute. This works great with a vests-only wedding ensemble, because a front left pocket is a must. For a little extra security, tape them to the inside of the pocket so they don’t disappear on you. Especially if you are having a small and relaxed wedding, this is an effortless way to go. Any of these choices will make the guys photos so much fun, and they will have fun with it. So pick your favorite heroes, and ‘Live long and prosper’. From a budget standpoint, using action figures alone from your own collection is a money saver and it can cut down on a little floral expense. But when combining into a floral boutonniere, the dollars will be about the same. 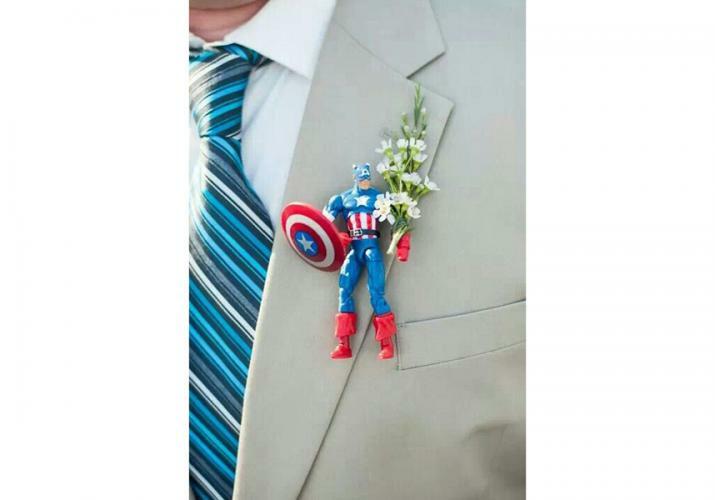 You may feel a little iffy about forgoing traditional flower boutonnieres for action figure stand-ins, but take a chance and try to have fun with it.